This Mrs. Claus is not that smiley nice lady that hands out apple cider and cookies (or milk if you choose). These ladies (if you can call them that) are more dangerous than they are sweet. These fantasy tales are great fun to read. Want to get in the mood for Christmas? Read these tales to learn what not to do. World Weaver Press sent me an ARC of this book to read for review (thank you). It will be published today. Red to Hide the Blood by Hayley Stone, which is the last story in this anthology, was one of my favorites. The best one in my opinion was the first story: Wight Christmas by Laura VanArendonk Baugh. 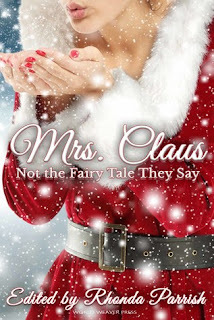 This Mrs. Santa has a heritage that stands her in good stead even if wights are out and about. I love strong women stories. None of these stories are bad, I enjoyed them all. Why not give it a read and tell me which stories touched you?